Although Baseball and softball are usually considered non-contact sports, baseball injuries and softball injuries do occur, often due to the repetitive nature of throwing, the demands of sliding, and the need to be able to sprint quickly. We have a plethora of braces to fit your needs. Listed below are the more common softball and baseball injuries and how we can help you in your recovery. Many of these braces do require a prescription from the doctor, please contact us with any questions! ANKLE SPRAIN: Often caused by twisting the ankle, can range from Grade 1 ( a slight stretch of ligaments) to Grade 3 (complete tear of the ligaments). It all depends on severity as to what brace the doctor prescribes. ELBOW (ULNAR COLLATERAL LIGAMENT) UCL TEAR: The UCL is the most important ligament for the stability of the elbow; softball or baseball injuries associated with the elbow occurs with the repetitive motion of throwing or a single trauma causing the ligament to stretch or tear. This injury may require surgery (Tommy John’s). GAMEKEEPER’S THUMB: Common name for the sprain of the ulnar collateral ligament (UCL) of the thumb; the result of repetitive grasping, gripping and pinching with the thumb or falling on hand or thumb. Immobilization can be provided with various thumb spicas. GLENOID LABRUM TEAR: The labrum is made up of cartilage that lines the socket of the shoulder joint. A tear can be caused by anterior instability, degeneration, or trauma. Surgery is sometimes indicated for this injury. LATERAL EPICONDYLITIS – An overload on the extensor tendon of the elbow and/or having a too tight of a grip on the bat. MEDIAL COLLATERAL (MCL) AND LATERAL COLLATERAL (LCL) LIGAMENT SPRAINS: May have pain on either inside (MCL) or outside (LCL) of the knee; caused by the knee being forced inward or outward. MEDIAL EPICONDYLITIS – The result of repetitive motion (a common culprit for many softball and baseball injuries) and/or having too tight of a grip on the bat. SHOULDER IMPINGEMENT SYNDROME: Caused my overuse of the shoulder joint (excessive amounts of throwing). ROTATOR CUFF INJURY: Overstretching of the four rotator cuff muscles (Supraspinatus, Infraspinatus, Teres Minor, and Subscapularis). If you are concerned you may have any of these softball or baseball injuries, contact us! We’re glad to help you with your recovery. 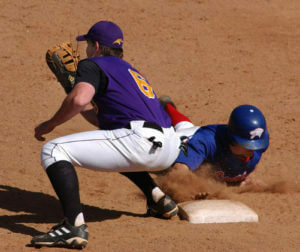 Our technicians have experience treating many softball and baseball injuries. Our specialists can answer your baseball/softball injury questions? Request an appointment online with a doctor's prescription.